The Irish-Swedish co-production from Writer/Director Stephen Burke transformed Cork City’s prison for filming this year, in one of many key moments for Film in Cork. Barry Ward (Jimmy’s Hall) and Love/Hate star Vaughan-Lawlor star in the feature film which chronicles the 1983 prison breakout of 38 IRA prisoners from HMP MAZE high security prison. The title will release in 2017 also featuring Irish talents Martin McCann (The Survivalist) and Seán T. Ó Meallaigh (An Klondike), and is produced by Jane Doolan of Mammoth Films and Brendan J Byrne of Cyprus Avenue Films. Burke is a two-time winner of the Cork International Film Festival for ’81’ and ‘After 68’. The project received funding from The Irish Film Board, Film Vast, RTE and BAI, with both Cork City Council and Cork County Council Arts Offices providing regional support. Cartoon Saloon’s one-day animation training event supported by Screen Training Ireland took place in April, which saw the team behind the Academy Award and BAFTA nominated studio share insights with professionals, students and amateurs alike. 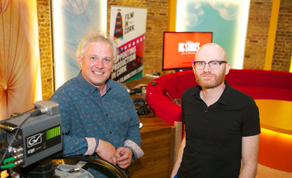 A new addition to the slate of training, production and location services provided by Film in Cork this year was the Production Club, sponsored by the Broadcasting Authority of Ireland (BAI). Monthly speakers from the industry included Stefanie Priessner, the writer being new series ‘Can’t Cope, Won’t Cope’, Documentary filmmaker Alex Fagan (Older Than Ireland) Cartoon Saloon CEO Paul Young , Paul Duane (Amber). The 2017 Short Script Award is another new addition to Film in Cork this year, a new funding initiative fostering resourceful filmmaking in the region. The winning project will receive €8,000 towards production costs and will be filmed in the city or county of Cork. In addition the winning team will receive mentorship from Film in Cork with location, production and festival planning over a nine-month period.